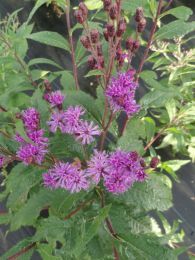 Perhaps the showiest of Ironweeds, Vernonia missurica's bright magenta, rayless composite flowers have over 30 disk florets (other Vernonia species typically have less). Also unlike other Ironweeds, Missouri Ironweed has many dense white hairs on the underside of its leaves, often lending them a silvery appearance. A member of the Sunflower family (Asteraceae), Missouri Ironweed blooms late summer to early fall. It is a great way to attract pollinators because it serves as a late-season nectar source. The caterpillars of some moths feed on Ironweed species, including Grammia parthenice (Parthenice Tiger Moth), Perigea xanthioides (Red Groundling), and Papaipema cerussata (Ironweed Borer Moth). Like milkweeds (Asclepia spp.) ironweeds (Veronica spp.) are bitter to the taste, so herbivorous animals like deer and cattle will avoid consuming it. This species is found most often near the central and southern Mississippi River valley. 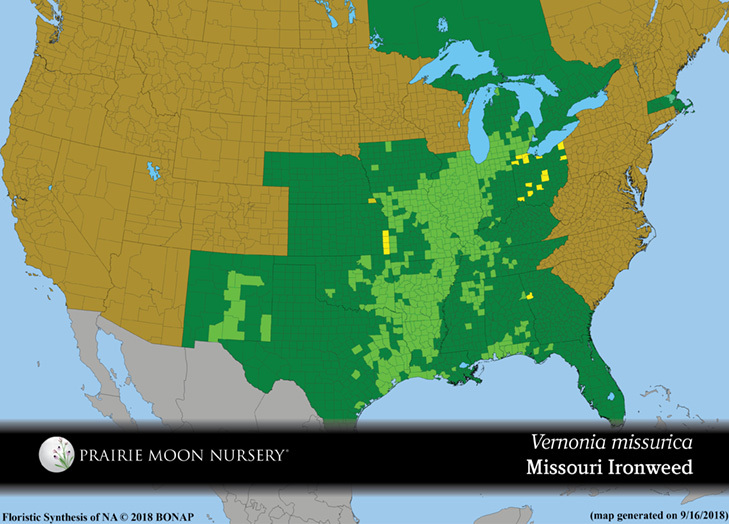 Missouri Ironweed will thrive in recently disturbed areas, as well as undisturbed high quality habitats. 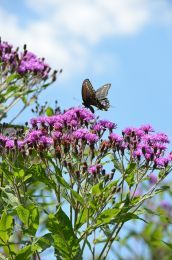 Although Missouri Ironweed is common in some states, it is endangered in Ohio. 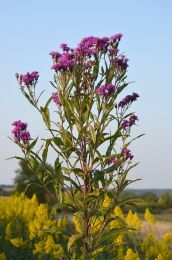 This plant’s dominant reproductive method is to spread by rhizomes, and readily self-hybridizes with other Vernonia spp. 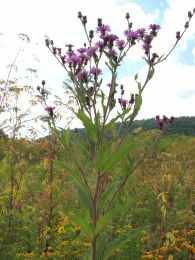 like Vernonia fasciculata (Common Ironweed), Vernonia altissima (Tall Ironweed), Vernonia baldwinii (Western Ironweed), and Vernonia noveboracensis (New York Ironweed) which can make plant ID difficult in the field. Expect to wait 3 years for it to flower. Dormant bare root plants ship each year during optimal transplanting season: Fall (October) or Spring (April/May). *please note, we are a mail order nursery and have no retail facilities, but you may pick up your order if prior arrangements are made. Pick up orders are subject to *MN Sales Tax. *MN State Sales Tax of 7.375% is applied for orders shipping to Minnesota only. Shipping & Handling Charges are also subject to the sales tax. *We are unable to ship PLANTS outside the contiguous US or to California due to regulations. We ship using USPS, UPS and Spee Dee. UPS and Spee Dee are often used for expediting plant orders; they will not deliver to Post Office Box numbers, so please also include your street address if ordering plants.